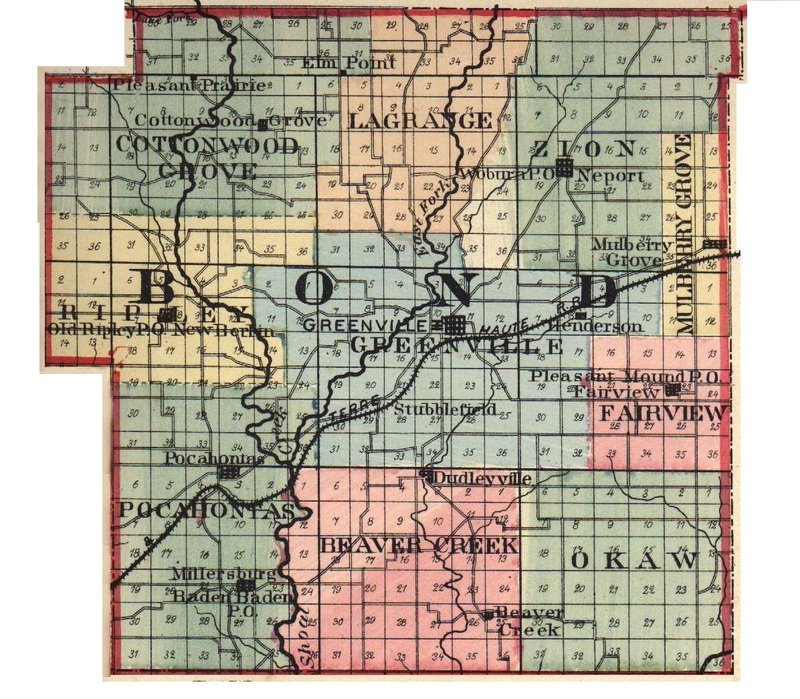 JACOB D. ROYER, a member of an old settled family of the county, and a prominent and extensive farmer and also a veteran of the late war, resides near Dudleyville, Bond County, Ill. He has here a farm of two hundred and thirty-two acres and is a successful grain farmer and stock-raiser. Our subject was born in Greenville, this county, November 18, 1838, and is the son of Daniel Royer, who came from a German family of that name which had settled over a large section in Pennsylvania. By occupation, Daniel Royer was a farmer and shoemaker, who came at an early day in the history of the county and settled near Greenville; later to the southeast of it he entered Government land. The journey to this location was a long and toilsome one over the mountains in wagons, and when he came and settled on his place the log cabin had yet to be built. Willing hands make light work, and with a will he cleared his land and worked at odd times at his trade, and when the Black Hawk War came on and men were required, he was one of those who went to fight the savages. His services were also given in the Mexican War. Mr. Royer had several farms and had some land warrants which he placed near Greenville. At that time deer and wolves were numerous, prairie chickens flew in clouds, wild turkeys ran through the brush, and the timber land was full of the nests of the wild honey bees. The death of Mr. Royer took place when he was about fifty-two years old, and he died in the faith of Calvin. His political adherence had been with the Democratic party. The mother of our subject was Mary Cockburn, who was born in South Carolina, although the marriage of the parents of our subject took place in Tennessee. She was the beloved mother of ten children, although only six of these grew to manhood and womanhood. These were: William, John, Jacob, Edward, Pleasant and Sarah. This worthy mother died when about seventy years old. Our subject was reared here and attended the log schoolhouse nearest his home, which in those days was called a subscription school. When twenty years of age, Mr. Royer began for himself, going out to the neighbors to work by the day. When the call came for troops, in the year 1861, he was one of those who came forward without delay, and joined Company F, Seventh Missouri Infantry, and was mustered into the service at the Arsenal at St. Louis. He saw service through Missouri, Kansas, Tennessee, Mississippi and Louisiana, and was in the battle of Vicksburg, and towards the close of the war he was appointed on detached duty, and was mustered out at St. Louis in June, 1864. He now receives a pension of $6 a month. The marriage of Mr. Royer took place in 1865, to Miss Elizabeth McCullag, who was born in Bond County, Ill., and they have now a family of one girl and seven boys, as follows: Alden, Sarah Ollie, Louis, George, Leslie, Emery, Arthur and Harry. Clowren is deceased. Our subject settled where he now lives in 1867, and at that time the place was entirely unimproved. He bought eighty acres and built a log house, but now he has two hundred and thirty-two acres, and all of this is improved with the exception of twenty acres. He raises great crops of grain and numbers of cattle, horses and sheep. Both he and his wife are highly respected members of the Free Methodist denomination. In his political belief, Mr. Royer is a Republican, and upholds the opinions of his party with vigor. His family is one of the best in the agricultural section of the State. Extracted 20 Dec 2016 by Norma Hass from 1892 Portrait and Biographical Record of Montgomery and Bond Counties, Illinois, pages 429-430.